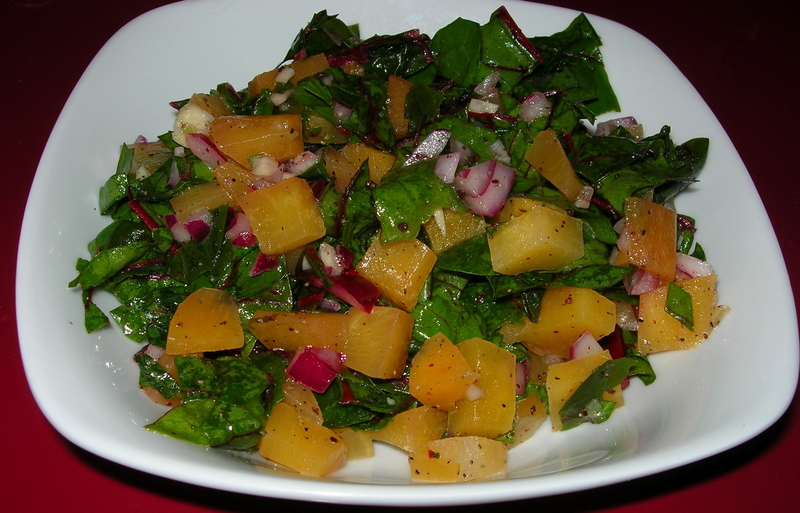 This is a fairly easy and delicious salad, rich in flavor and texture. I started by peeling and cutting a few rutabaga into cubes and parboiling them. I cooked them until they became just fork tender, but still toothsome. Straining off the water, I put the chunks in the fridge to cool, available for salad making. I used about 1/3 of what I had cooked in this salad. I cut up two cups red chard leaves sliced into ribbons, added 2 cloves of crushed garlic, 1 tsp of kosher salt and 1 tbsp of olive oil and massage the red chard until tender. I added 1 cup of the rutabaga chunks and 1/2 tsp of sumac. I then added 1/4 cup of chopped red onions. Stirring together I added the juice of half of a fresh lemon and put in a plastic bowl with a l id so there flavors could marry by sitting together for a few hours. After marinating, serve with a bit of pepper to taste. Rutabaga responds to sumac like a fruit, developing an even richer flavor. The earthy chard, the bite of garlic and the fruity tang of rutabaga meld beautifully with the sumac, lemon and oil. This makes one large serving or two side servings.